This tutorial demonstrates how to append Word documents by using a Combine multiple Word documents Step	within a Flow. Begin in a designer Folders and Create a Flow	. 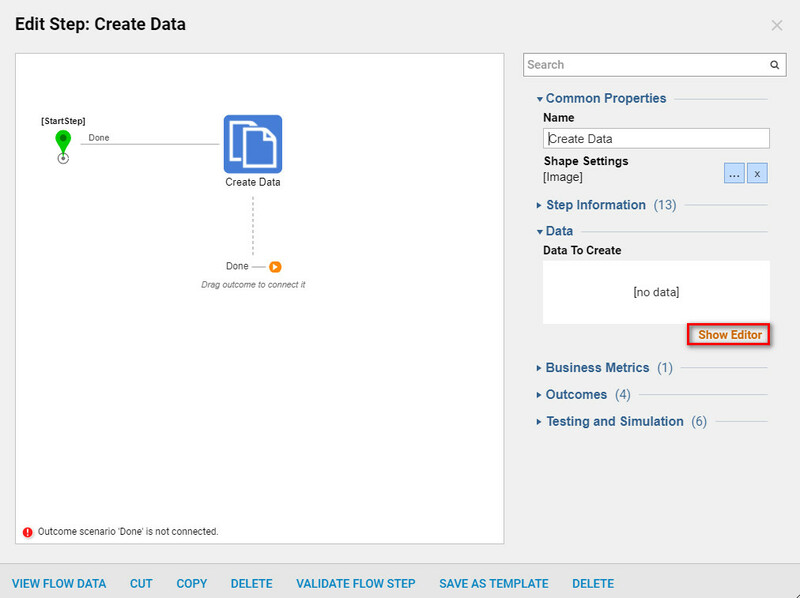 Name your Flow and begin with a Create Data Step	in the Flow Designer. In the Steps tab,	navigate to All Steps> [Catalog]>Data>Create Data step	or under Favorites locate Create Data. In the resulting Create Data window , under Common Properties select Show Editor. Next, in the Show Editor	window (Figure 2)	, add the data definition names and define the Type	as FileData. Check the (Is list	) box on the right next to the Type. Now add a Word Document to each data definition. See under Inputs	the display image with options Drag a file	or Choose a File	to upload and attach a file to each data definition. SelectClose	to stave the data names. When the data definitions and the Word document file are added to each data definitions, they will now display underData	with the given name. 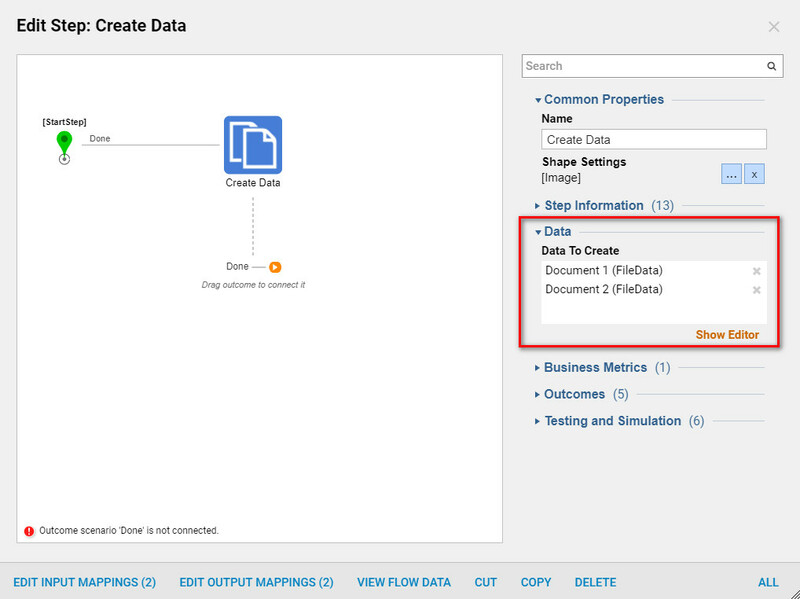 Navigate to the Flow designer, in the Steps Tab locate All Steps [Catalog]>Data> Documents> Append Word Doc To Word Doc Step,	add or drag and drop in the Flow designer. This step can append two Word documents at a time. If more than two Word documents need to be appended simply add Combine Mulitple Word Documents Step. This step is located in the Documents Tab. 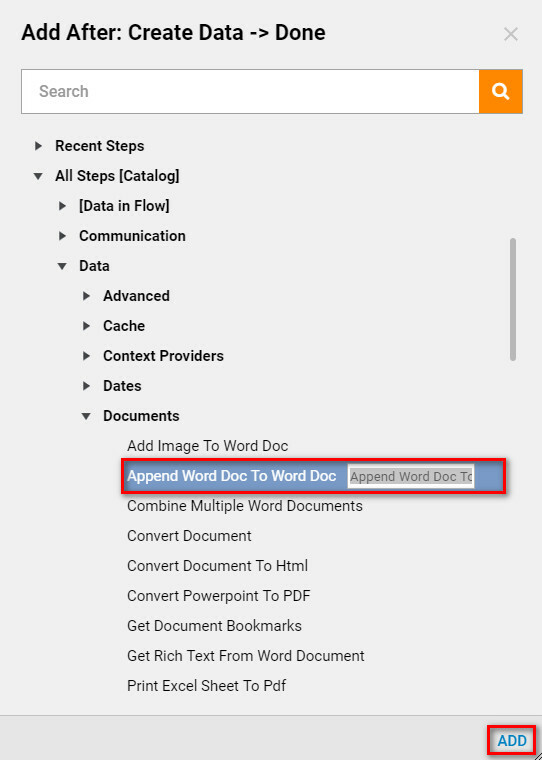 Next, configure the Common Properties on the Append Word Doc To Word Doc Step (Figure 5). Under Inputs and next to document Being Added,	choose Select From Flow. Here Pick	the Document that you would like to merge with the first document(defined in the data definitions). Choose Document 2 to be added to Document 1. 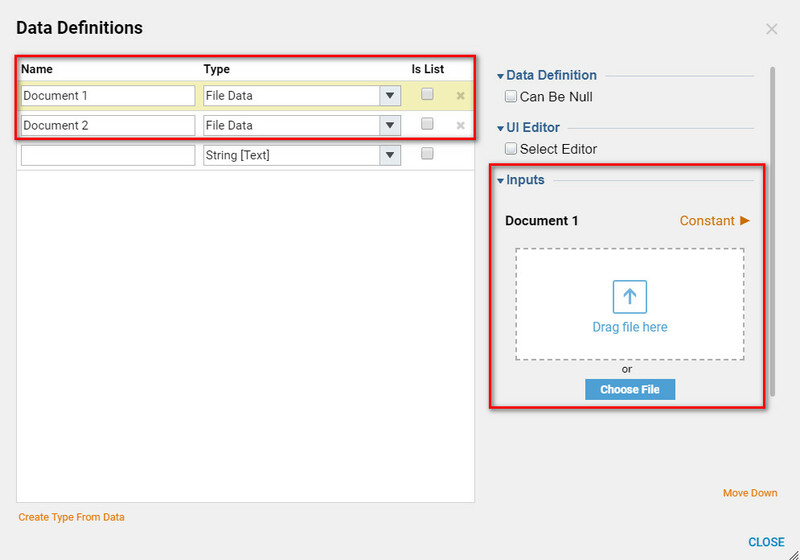 Next to document File To Append To Append, chooseSelect From Flow	and Pick	Document 1. Note	: To display and view the Word document on a Form inside the flow, add a File Download End Form. Connect that pathways, save and close the Flow designer. Locate the File	Download End Form	by navigating to the Steps Tab: Forms [End]>File Download End Form Step. Note	: Add a File Download End Form	to download and view the Word Documents on a Form inside the flow. Connect that pathway and save and close the Flow designer. To add File	Download End Form,	navigate to the Steps Tab to Forms [End]>File Download End Form Step. 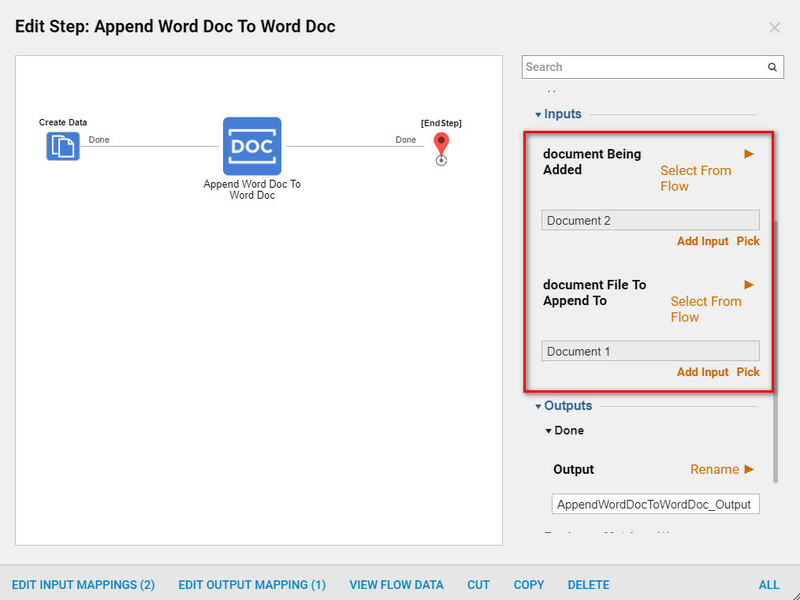 This completes Append Word Document	Flow example . Select Debug	located on the top orange panel in the Flow designer to test the Flow. Diagram Tab	in the Debugger	indicates whether or not the Flow executed has any errors or not.